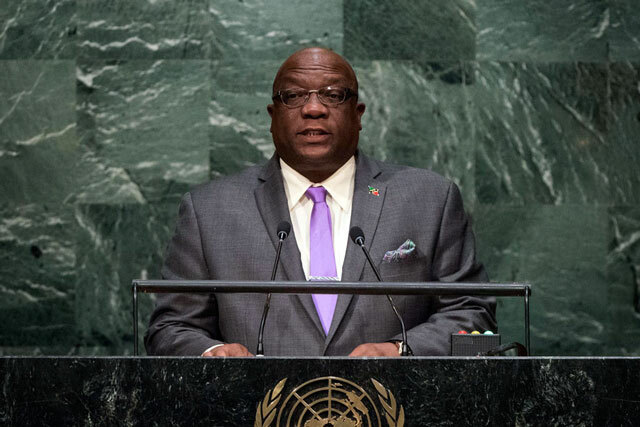 The current status of St. Kitts and Nevis’ economy and strategic priorities of the Team Unity administration were discussed this week by Prime Minister Dr. the Honourable Timothy Harris during International Monetary Fund (IMF) and World Bank meetings in Washington, DC. In his capacity as Minister of Finance for St. Kitts and Nevis, Dr. Harris attended meetings of both organizations. World Bank authorities, headed by Ms. Sophie Sirtaine, Country Director for the Caribbean Country Management Unit, congratulated Dr. Harris for the sound macroeconomic performance of St. Kitts and Nevis. They also confirmed that the World Bank stands ready to support St. Kitts and Nevis in the important long-term development priorities highlighted by the Prime Minister, like the strengthening of the banking sector’s strategy to deal with de-risking, improving the delivery of social services like education and health care, and building adequate resilience mechanisms against climate-driven disasters. Earlier in the day, Dr. Harris met with high-level World Bank authorities. The St. Kitts and Nevis delegation was also comprised Her Excellency Dr. Thelma Phillip-Browne, Ambassador to the United States of America, and His Excellency Dr. Everson Hull, Ambassador and Permanent Representative to the Organization of American States. The International Monetary Fund and the World Bank Group (known as the “Bretton Woods institutions” because they were formed at a meeting of 43 countries in Bretton Woods, NH in July 1944) are central players in the world’s financial architecture. Their focus is on reducing poverty, as well as promoting global economic and financial stability. On Oct. 5, Dr. Harris was a special guest at a Constituency Reception for visiting National Delegations, under the auspices of James A. Haley, Alister Smith, and the offices of the Executive Director for Canada, Ireland, and the Caribbean at the IMF and World Bank Group. The event was attended by Canada’s Minister of Finance, the Honourable William Francis Morneau, who represents Canada on the Board of Governors of both the IMF and the World Bank Group. Canada’s Constituency at the IMF and the World Bank Group includes, in addition to Canada, Antigua and Barbuda, the Bahamas, Barbados, Belize, Dominica, Grenada, Guyana (World Bank Group only), Ireland, Jamaica, St. Kitts and Nevis, St. Lucia, and St. Vincent and the Grenadines. Governors, such as Canada’s Minister of Finance, delegate day-to-day decisions to an executive director at both institutions. James A. Haley serves as Executive Director for the Constituency at the International Monetary Fund and Alister Smith serves as Executive Director for the Constituency at the World Bank Group. During annual and spring meetings of the IMF and the World Bank Group, Canada’s Finance Minister tables written statements for the International Monetary and Financial Committee (IMFC) of the Board of Governors of the IMF. The IMFC, which is focused on global growth and stability, as well as on jobs, is a policy steering body of the International Monetary Fund, and the statements presented by the Canadian Finance Minister outline Canada’s and its Constituency’s views on the governance, lending and surveillance activities of the Fund.